Conventional sub-Nyquist sampling methods for analog signals exploit prior information about the spectral support. Here, we consider the challenging problem of blind sub-Nyquist sampling of multiband signals, whose unknown frequency support occupies only a small portion of a wide spectrum. 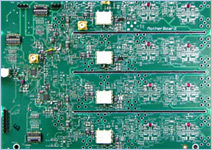 Our primary design goals are efficient hardware implementation and low computational load on the supporting digital processing. We propose a system, named the modulated wideband converter, which first multiplies the analog signal by a bank of periodic waveforms. The product is then lowpass filtered and sampled uniformly at a low rate, which is orders of magnitude smaller than Nyquist. Perfect recovery from the proposed samples is achieved under certain necessary and sufficient conditions. We also develop a digital architecture, which allows either reconstruction of the analog input, or processing of any band of interest at a low rate, that is, without interpolating to the high Nyquist rate. 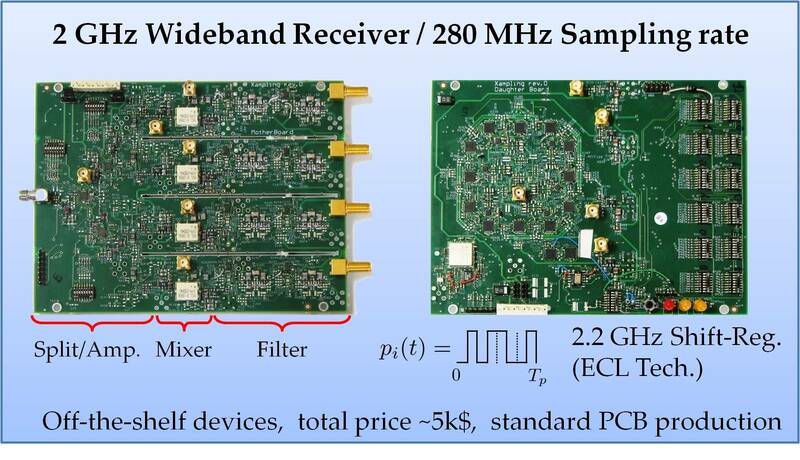 The MWC is useful in cognitive radio applications where opportunistic users exploit temporarily vacant bands after detecting the absence of activity of their owners. One of the crucial tasks in cognitive radios is spectrum sensing and detection which has to be precise and efficient. Yet, such radios typically deal with wideband signals whose Nyquist rates are very high. Therefore, the MWC can be used as an enabler of cognitive radio technology offering a convenient and low rate solution to the spectrum sensing challenge. For more details on this application see here. the input x(t) has multiband spectra with energy that concentrates on N frequency intervals of individual widths B located anywhere below some maximal frequency fmax. Since each combination of carrier frequencies determines a single subspace, a multiband signal can be described in union terminology by indexing the possible spectral supports with \lambda and letting A_\lambda capture the signal content on the chosen support. In principle, fi lies in the continuum [0,fmax] in this modeling, so that the union contains infinitely many subspaces. A different viewpoint is to divide the Nyquist range to M slices and enumerate the possible supports according to the slice indices that contain signal energy. This approach results in a finite union of bandpass subspaces. The vector y[n] has length m, as the number of sampling sequences that the hardware produces. The vector z[n] has length M, with entries corresponding to the spectrum slices. Typically, m<M so that the total sampling rate is below Nyquist. The approaches below realize this viewpoint using different analog compression techniques. Recovery from y[n] is described afterwards. 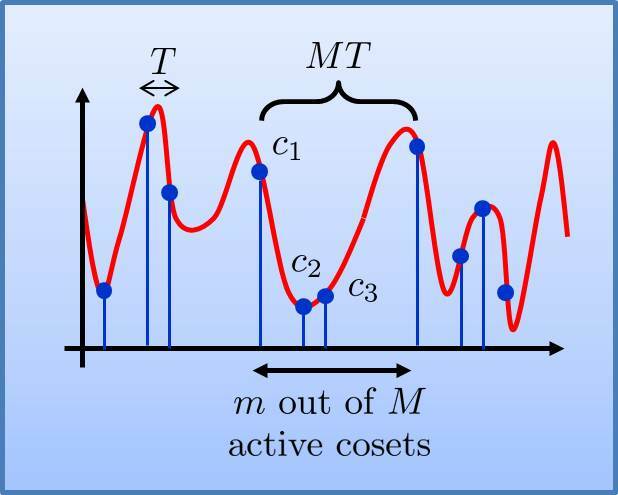 Periodic nonuniform sampling is obtained by selecting a sampling pattern of m points within an interval of length MT, where T is the Nyquist interval, and repeating this sampling pattern on consecutive intervals of length MT. In this approach, we define yi[n] for the uniform sequence corresponding to the sampling points in shift ciT. The sensing matrix C in this approach is a partial DFT matrix. m >= 4N, f_s= 1/T >= B. An advanced configuration enables to collapse the number of branches m by a factor of q at the expense of increasing the sampling rate of each channel by the same factor, so that f_s=q/T but the overall sampling rate mf_s is unchanged. In principle, the advanced configuration allows to collapse the MWC system to a single sampling branch using q=m. 1/T, and a weighted-sum of these slices is shifted to the origin. The lowpass filter h(t) transfers only the narrowband frequencies up to f_s/2 from that mixture to the output sequence y_i[n]. An efficient subspace detection approach is the continuous to finite (CTF) block depicted below. The CTF recovers the set of active bandpass slices as follows. First, it constructs a matrix V from several (typically 2N) consecutive samples y[n], either by direct stacking y[n] into the columns of V, or via other simple computations that allows combating noise. Then, it solves the following underdetermined system V=CU, for the sparsest solution matrix, namely U with minimal number of nonidentically-zero rows. The indices of these nonzero rows are proven to detect the set of active spectrum slices of x(t). where the H denotes conjugate transpose, and subscripts are column/entry restrictions. Standard DAC techniques reconstruct x(t) via lowpass interpolation of z_l[n] and modulation to the proper positions on the spectrum. 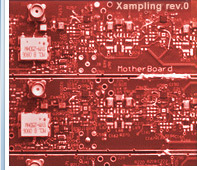 The MWC has been implemented as a board-level hardware prototype. The hardware specifications cover inputs with 2 GHz Nyquist rate and NB=120 MHz spectrum occupation. The prototype has m=4 sampling branches, with total sampling rate of 280 MHz, far below the 2 GHz Nyquist rate. In order to save analog components, the hardware realization incorporates the advanced configuration of the MWC with a collapsing factor q=3. In addition, a single shift-register provides a basic periodic pattern, from which m periodic waveforms are derived using delays, that is, by tapping m different locations of the register. More details and documentation are available online here. M. Mishali and Y. C. Eldar, "Wideband Spectrum Sensing at Sub-Nyquist Rates", IEEE Signal Processing Magazine, vol. 28, no. 4, pp. 102-135, July 2011. M. Mishali and Y. C. Eldar, "Blind Multi-Band Signal Reconstruction: Compressed Sensing for Analog Signals", IEEE Trans. on Signal Processing, vol. 57, no. 3, pp. 993-1009, March 2009. M. Mishali and Y. C. Eldar, "Reduce and Boost: Recovering Arbitrary Sets of Jointly Sparse Vectors", IEEE Trans. on Signal Processing, vol. 56, no. 10, pp. 4692-4702 , October 2008. 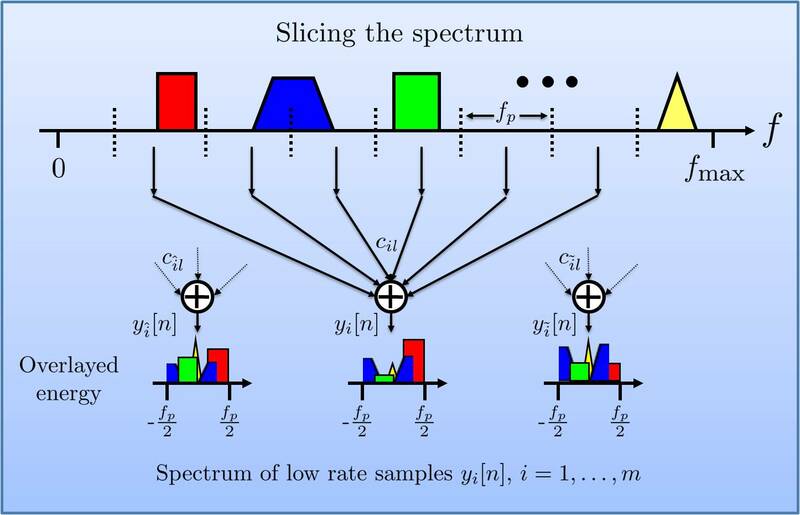 M. Mishali and Y. C. Eldar, "From Theory to Practice: Sub-Nyquist Sampling of Sparse Wideband Analog Signals", IEEE Journal of Selected Topics on Signal Processing, vol. 4, no. 2, pp. 375-391, April 2010. M. Mishali, Y. C. Eldar, O. Dounaevsky and E. Shoshan, "Xampling: Analog to Digital at Sub-Nyquist Rates", IET Circuits, Devices & Systems, vol. 5, no. 1, pp. 8–20, Jan. 2011. Simulation package of sub-Nyquist sampling and support recovery using the modulated wideband converter (MWC). This page describes the MWC design, the Matlab code, and offers two software packages: analog and digital versions. The former simulates the samples that would have been obtained by true hardware. The latter provides a digital approximation of the MWC. The analog simulations consume more time but are more accurate. A GUI package written in Matlab that provides a user-friendly introduction of the MWC. The GUI environment guides the user through 4 steps: building a multiband model, configuring the MWC and sub-Nyquist sampling, support recovery using the continuous-to-finite (CTF) block, and finally continuous reconstruction. 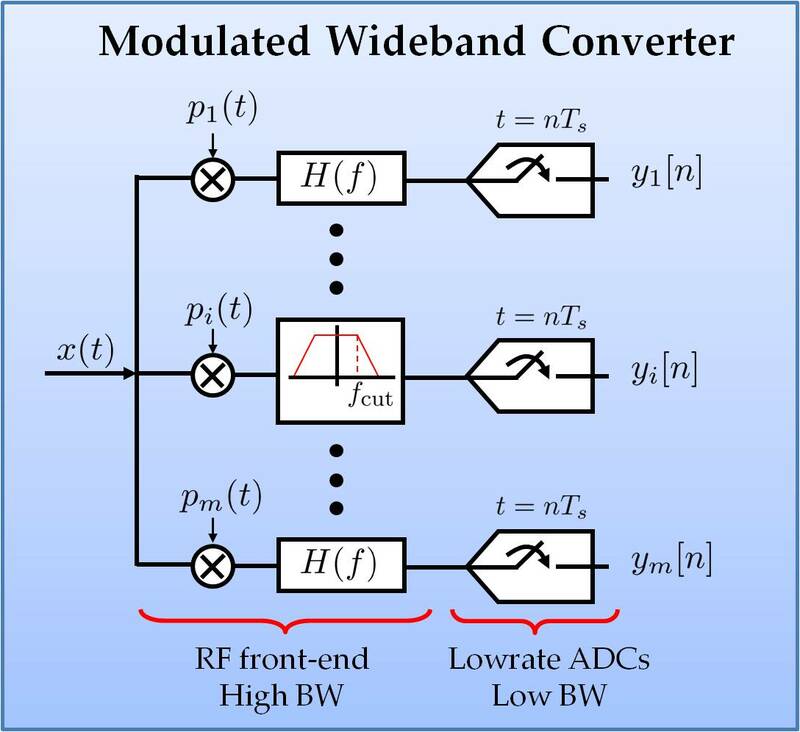 The modulated wideband converter (MWC) enables sub-Nyquist sampling of narrowband transmissions, when their carrier frequencies are unknown to the sampler. Reconstruction from the MWC sub-Nyquist samples is demonstrated in the package above. This GUI package provides signal processing of the narrowband transmissions by estimating the carrier frequencies from the lowrate samples. It also recovers the information bits that are encoded in the narrowband transmission of interest.